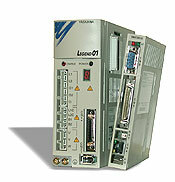 The SMC-3010 is a single-axis motion controller with Ethernet communication. The SMC-3010 has the same easy BASIC-like text programming as the SMC-4000 series and original SMC-2000 series. The SMC-3010 attaches to any Yaskawa LEGEND amplifier and complements Yaskawa’s “7” series variable speed drives. The standard Ethernet feature provides seamless communication to the Yaskawa inverter family with the Modbus TCP/IP protocol. This same feature enables the addition of many third-party Ethernet I/O devices. A single SMC-3010 can command several axes of SMC-3010’s over Ethernet using the TelNet commands. Only one program is stored on the master SMC-3010 in this architecture, which is well-suited for non-coordinated multi-axis motion. The SMC-3010 provides several modes of operation, including point-to-point positioning, registration positioning, and following of external devices via gear ratio or cam profile.